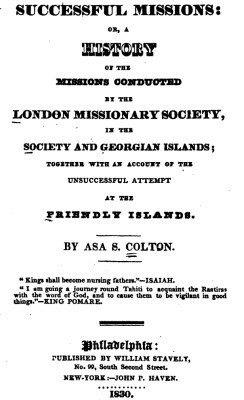 William Richards : Shark Attack at Lahaina, 1826.
together with an account of the unsuccessful attempt at the Friendly Islands. Here (the Society Islands-Tahiti), as at the Sandwich Islands, swimming in the surf was a common amusement. enveloped in the surf, and sometimes mounted upon the crest of the waves. Here also, as at the Sandwich Islands, there is a frequent cause of alarm to those who sport in the surf. In illustration of this remark, no description can be so pertinent, as the account given by Mr. Richards, of an incident which occurred at Lahaina. Though it happened at the Sandwich Islands, it is equally descriptive of occurrences at any of the islands of the Pacific. "At nine o'clock in the morning of June 14th, 1826, while sitting at my writing-desk, I heard a simultaneous scream from multitudes of people, Pau i ka mamo! Pau i ka mano! The beach was instantly lined by hundreds of persons, and a few of the most resolute threw a large canoe into the water, and alike regardless of the shark, and the high rolling surf, sprang to the relief of their companion. The shark had already seized his prey. The affecting sight was only a few rods from my door, and while I stood watching, a large surf almost filled the canoe, and at the same instant a part of the mangled body was seen at the bow of the canoe, and the shark swimming towards it at her stern. When the swell had rolled by, the water was too shallow for the shark to swim. a red tinge in all the foaming rollers, as they approached the beach. I saw his mother in the extremity of her anguish, plunge into the water, and swimming towards the bloody spot, entirely forgetful of the power of her former god. As she followed the remains to the house, Mrs. Richards and myself accompanied her, and endeavoured to assuage her grief. "The particulars I found on inquiry to be these. A great number of people, perhaps one hundred, were playing in the surf, which was higher than usual. Those who were nearest to the victim heard him screech, and perceived him to strike with his right hand, and at the same instant saw a shark seize his arm. Then followed the cry which I heard, which echoed from one end of Lahaina to the other. When the canoe reached the spot, they saw nothing but the blood, with which the water was stained for a considerable distance, and by which they traced the remains whither they had been carried by the shark, or driven by the swell. The body was cut in two by the shark, just above the hips, and the lower parts, together with the right arm, were gone. a superstitious veneration for the shark, and this veneration is increased rather than diminished by such occurrences as these. "It is only about four months since a man was killed in the same manner at Waihee, on the eastern part of the island. It is said, however, that there are much fewer deaths by the shark than formerly. This perhaps may be owing to their not being so much fed by the people, and therefore do not frequent the shores so much." attempt at the Friendly Islands. Geoff Cater (2017) : William Richards : Shark Attack at Lahaina, 1826.